The bloom is certainly off the flower, when the SA starts publicizing the mythologies contained in the corners of forensic expertise. The conference was organized in response to a 2009 publication by the National Research Council entitled Strengthening Forensic Science in the United States: A Path Forward, which the U.S. Congress commissioned when it became clear that DNA was the only (barely) reliable forensic science. 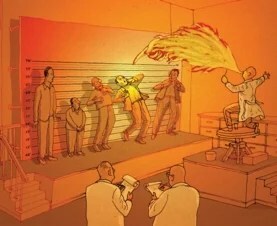 The report concluded that “the forensic science system, encompassing both research and practice, has serious problems that can only be addressed by a national commitment to overhaul the current structure that supports the forensic science community in this country.” Among the areas determined to be flawed and in need of more research are: accuracy and error rates of forensic analyses, sources of potential bias and human error in interpretation by forensic experts, fingerprints, firearms examination, tool marks, bite marks, impressions (tires, footwear), bloodstain-pattern analysis, handwriting, hair, coatings (for example, paint), chemicals (including drugs), materials (including fibers), fluids, serology, and fire and explosive analysis. Take fire analysis. According to John J. Lentini, author of the definitive bookScientific Protocols for Fire Investigation (CRC Press, second edition, 2012), the field is filled with junk science. “What does that pattern of burn marks over there mean?” he recalled asking a young investigator who joined him on one of his more than 2,000 fire investigations. “Absolutely nothing” was the correct answer. Most of the time fire investigators find nonexistent patterns, Lentini elaborated, or they think a certain mark means the fire burned “fast” or “slow,” allegedly indicated by the “alligatoring” of wood: small, flat blisters mean the fire burned slow; large, shiny blisters mean it burned fast. Nonsense, he said. It may take a while for a fire to get going, but once a couch or bed burns and reaches a certain temperature, you are not going to be able to discern much about its cause. Lentini debunked the myth of window “crazing” in which cracks indicate rapid heating supposedly caused by an accelerant (arson). In fact, the cracks are caused by rapid cooling, as when firefighters spray water on a burning building with windows. He also noted that burn marks on the floor are not the result of a liquid deliberately poured on it. When a fire consumes an entire room, the extreme heat burns even the floor, along with melting metal and leaving burn marks under a doorway threshold, which many investigators assume implies the use of an accelerant. “Most of the ‘science’ of fire and explosive analysis has been conducted by insurance companies looking to find evidence of arson so they don’t have to pay off their policies,” Lentini explained to me when I asked how his field became so fraught with pseudoscience. This entry was posted in Uncategorized and tagged American Academy of Forensic Science, AMERICAN BOARD OF FORENSIC ODONTOLOGY, Criminal Justice, CSI, forensic examiner error, Forensic science, junk science, Miscarriage of justice. Bookmark the permalink. 3 Responses to Can We Trust Crime Forensics? Dr. Shermer attended a meeting that was intended to focus on problem areas in forensic science. So it is no surprise that he can tell us about the flaws that we discussed at the meeting. I think, however, that he over-generalizes the problem in this SA article. Not all of forensic science exhibits the same problems as bite marks and fire investigation, and that point was made clear at the meeting. Perhaps he was out of the room at that point. Dr. Victor Weedn, President of the AAFS, has sent a reply to SA. It remains to be seen if SA will publish it. Motivational bias, a perfect example.